This recipe is one of baby boy's favorites. It tastes so creamy, yet it only has 2 Tbsp butter and no cream. 1. Heat a little oil in a large saucepan. Saute onions until softened. 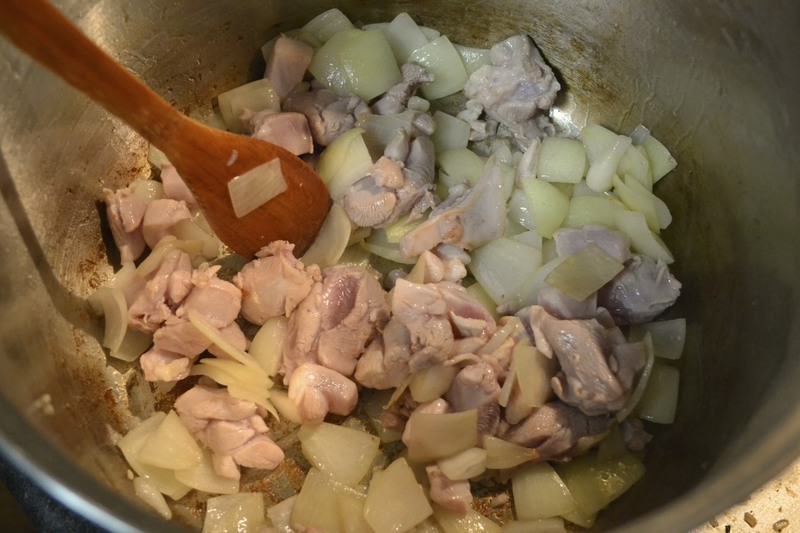 Add Chicken and stir until browned over high heat. 2. Add potatoes, chicken stock and water. Bring to boil and simmer. 3. 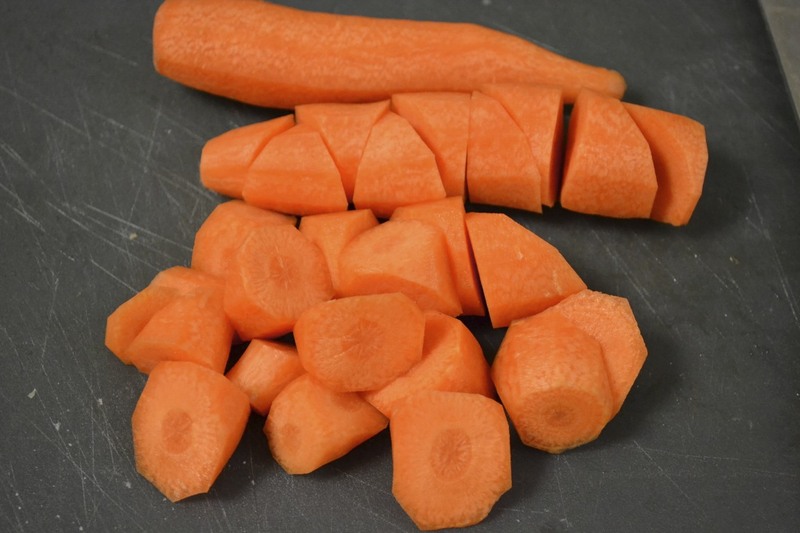 Meanwhile, peel and slice carrots into triangular chunks. Add to saucepan. Simmer. There should be just enough liquid to cook everything, not too much. Add 1/4 cup of milk and the flour. Whisk until smooth, over low heat. 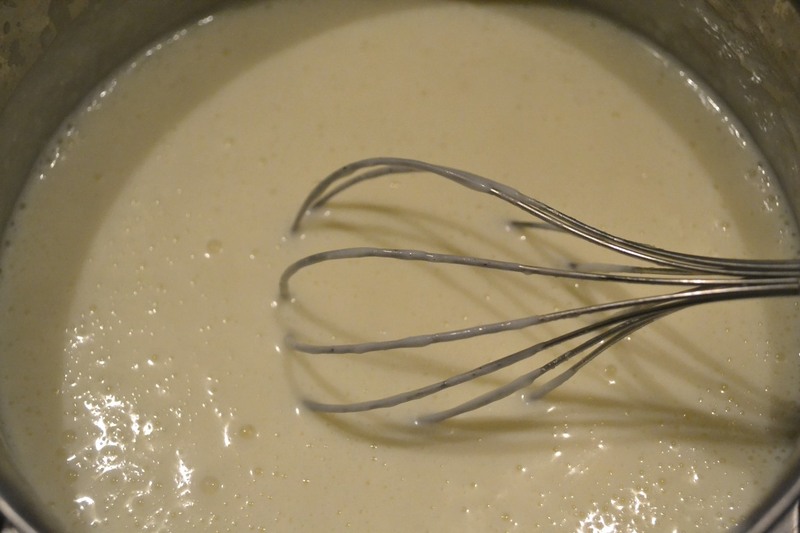 Add the rest of the milk gradually, while whisking. Continue stirring, increasing the heat until the mixture thickens and bubbles. Add cheese if desired. 5. Add the cream roux (step 4) to the stew, add broccoli, and bring to a gentle boil one more time. Taste and season with salt and pepper. Served in individual serving bowls with a separate bowl of steamed rice. Or in the same bowl. Eat with a spoon. To make into baby's favorite healthy food: Cook another 3 min until broccoli is softened. Mash and mix with rice. I like to make large batches and freeze baby's lunches. Don't forget to click the facebook "like" button in the left sidebar to win! Jane, It looks delicious. I'll be making this for dinner tomorrow. Thanks!! Actually I wanted to say to "Little Japan Mama" that no salt or pepper? "You don't add"? 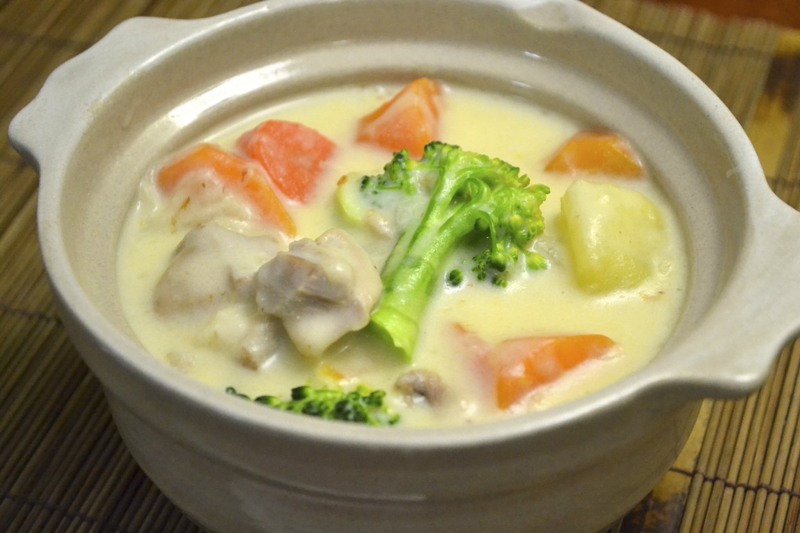 Also... that Cream Stew Rue, recently I used it again (I lived in Japan for almost 25 years). I had a bad reaction after eating it recently. I would recommend NOT using that. Besides the MSG... so I'm very happy to get your recipe which I am making right at this moment!!! daisuki, oishi! i love this! the only thing i changed was the chicken and made it spicier, thanks for the recipe. I think I put too much ingredients in and it (a bad habit of mine) turned into a HUGE pot but it was great! =D Now I know how to make cream stew from scratch! Awesome! I always make a huge pot, it freezes well, and is especially good for frozen baby/toddler meals! This is delicious! I love being able to use up vegetables in the fridge. My hubby & I love this recipe! So delicious! This was AMAZING!!! I always bought the boxed roux which is full of MSG and chemicals. Your recipe tastes a million times better!!! Just thinking about it makes me want to make it again. I did not add any cheese and it was still AMAZING! Thank you so much for sharing this recipe! Going to make this for dinner tomorrow. Came upon your site very recently and fell in love with it. 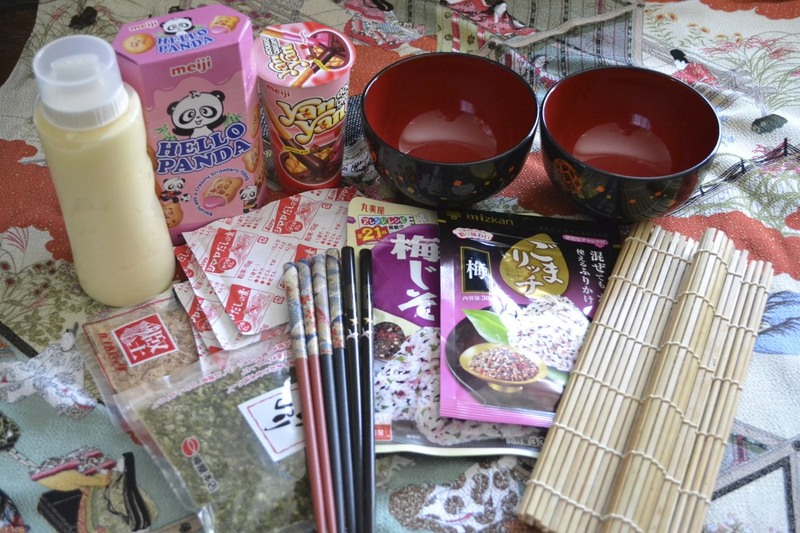 My boyfriend is very happy with it as well since he absolutely loves Japanese food that's more than just sushi and the like. We eat Japanese dishes on a regular basis in our household, but you'd be surprised how hard pressed it is finding authentic Japanese recipes online that aren't dumbed down or completely slaughtered into something far too Westernized to even be called Japanese food anymore. Although this dish doesn't seem especially Japanese in the sense that it won't have strong flavors that we're accustomed to eating; I've got to say I just needed to try this since I saw it in a film back when I was a kid. Never knew the name of it until now! So thank you so much for bringing this dish to me so that I could make it in my own home. Thank you very much for this recipe Shinobu. When my Japanese wife was ill and not up to cooking last week I asked her what she wanted to eat, and the reply was 'cream stew'. I've always enjoyed hers, but wasn't sure my limited cooking skills were up to making this. 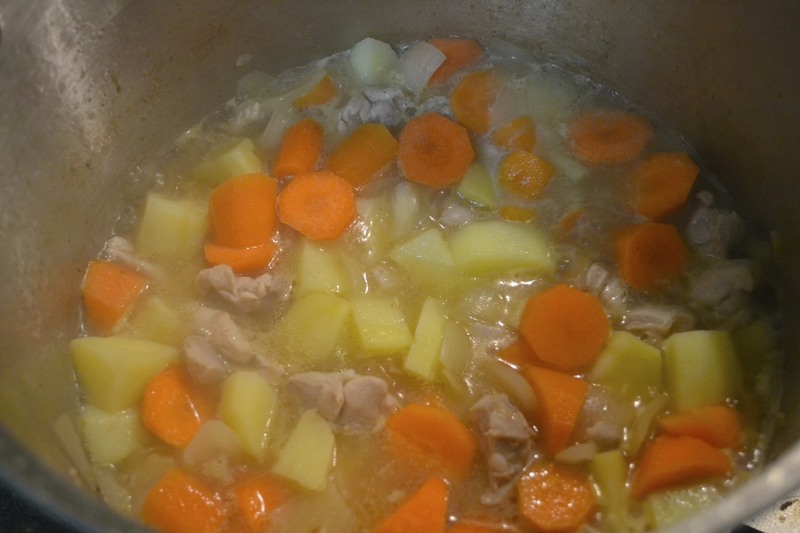 However, after finding your recipe, I managed to make something that (much to her amazement as much as mine) was as good as any cream stew I've ever had. She feels much better now, and I feel much better at cooking....Thanks. I have been making cream stew with the packaged roux for many years, but one day I didn't have any on hand, and found your recipe online. I love it - it really is better than the packaged kind, and really doesn't take much more time or effort at all. I'm never going back! Thanks for sharing!! I totally agree, Sue! And it's healthier too! I made this and it was very yummy!!! Hi! What kind of flour did you use? All purpose flour? My husband cooks but I don't. I was so craving for "kuri-mu shichu" and can't buy the box in my area. Thank you for saving me from homesickness!!! LimeGreen, so glad to help! I totally understand, my parents' family lived in Bundaberrg, a country town, when I was a kid! Simple and just like my mum makes. Shes Japanese too by the way. I'm not a parent (too young, after all), but I AM the eldest of seven siblings so I'm pretty close, and I know what I'm making for dinner when it's my turn! So creamy and delicious! Feels good making it from scratch. I put a link on my blog. Thank you! NONE! Don't use that msg laden "roux". Just do what her recipe says with butter, flour , and milk! I really really wanted stew for my birthday. Thanks for making my wish come true! Even with no potatoes and pork instead of chicken (I can't tell them apart when they're frozen haha) this recipe turned out great! 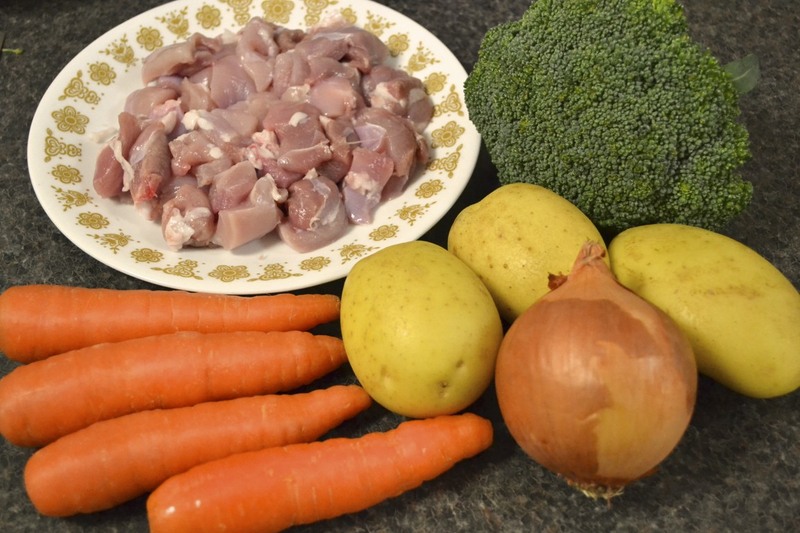 How much is 400g of chicken? I have made this easily 10 times since I first found the recipe. The whole family loves it! Thank you for sharing. Hello! I recently moved out of home for the first time and have been saved many times by your recipes!! I am in Australia too so it's much easier to get the ingredients you mention here than some of the other websites/recipes out there. I was so proud that I managed to make the cream stew from scratch without buying the instant pre-made roux haha. Thanks so much for sharing your recipes, and I can't wait to cook some more! Take care and I love your website! This reminded me of Japan! I used to live on the S&B stews and curries and this was perfect! Thank you! Hello, just wanted to say that I have made this recipe many times while I was in college. I love it. It's so delicious. Thank you for this recipe! I've recently moved back home from college and I plan on making it for my family who has never had cream stew before! I know they'll love it! !